My last post was a recipe for the two most common cakes I have made. In it I discussed how to make a batter and scale it out for what you need. What I didn't touch upon was baking that cake and knowing when it is done. You may think (like I once did) just pour it in the pan and use a toothpick. But in truth there are a few simple steps to baking a cake that will come out correctly. One of the most important things is to prep the pan properly. These steps work for most cakes (except angel food cake). First and I think one of the most important steps is to grease and flour the pan. I use butter to grease the pan. All you need to do is just put a pad of butter in the pan and push it around with your hand. Make sure all areas are covered. Next put a little bit of flour in the pan and shake it around till it is completely covered. I feel this is the most important step because it ensures the cake will come out of the pan. If it doesn't come out of the pan correctly then you don't have a cake--you have some wasted batter! I know some people use the canned spray to cover their pans and that is fine, but I just feel that I would rather not put chemicals into my food. There are three ways to know a cake is done without using a toothpick. They are easy to remember and help you to know where your cake is at without putting holes everywhere. 2) Bounce back - you should be able to lightly press on the top of your cake and it should spring or bounce back. If it stays indented then the cake is not done yet. 3) Pulls away from pan - if you greased the pan correctly you should see the cake start to shrink away or pull away from the sides of the pan. After the cake comes out of the oven, leave it sit for a minute then remove them from the pan onto a cooling rack. This is important so that the steam can be released from the inside of the cake into the air and not recirculated back by the walls of the pan. Basic yellow butter cake before baking. The same yellow butter cake after baking. Note how it is now light brown and has pulled away from the pan. For our Facebooking friends, we've set up a Facebook page for the blog. Click here to check that out. Anytime Laurie or I update the blog, if you've liked that Facebook page you'll automatically see a note on your news feed and you can easily stay up to date with our latest posts. You can also like us by clicking the link in the Facebook toolbox in the right column. I also wanted to give a really special thanks to our great longtime friend Lisa Toff. 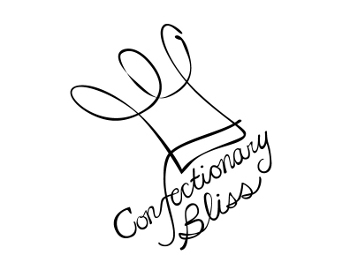 Lisa is a really talented artist and designer who helped us turn a paper sketch Laurie had made for the Confectionary Bliss logo into something we could actually put on the website. She runs prismPOP and does all sorts of clever, unique pop art. She also has a design, arts, and Coney Island blog at myconey.wordpress.com. So a big thanks to Lisa for helping us out with that. Go check her stuff out and be amazed by her creative talents. when using cups and spoons they can differ from day to day depending on how much you pack the ingredients down or whether or not you sift it. By weighing it stays the same no matter what. you don't have to wash the extra cups and spoons. I also prefer to use the metric system. It means less conversions from pounds to ounces in order to divide or increase a recipe. I try to convert recipes that are in cups into grams as I am working so that I will have the recipe consistent for later use. You will see in future posts that most of my recipes will be in grams. Scales are pretty cheap and can be purchased at most houseware stores. If you prefer to convert them back to cups, at the bottom of this post is a chart of some common, quick baking measurement conversions. There are also plenty of online sites that will do the math for you, such as http://www.onlineconversion.com/cooking.htm. It allows you to make sure you have everything you need. This way you are not in the middle of mixing and realize you don't have enough of an ingredient. It helps you work cleaner and more organized. Our two year wedding anniversary is coming up next month, so I thought why not post about the wedding cake cookies I made for all of our guests' hotel goodie bags. The plan was to make homemade cookies for every guest who stayed overnight for our wedding. Well, our kitchen is kind of small and it wasn't not feasible to make a cookie for each person. So I made one or two per bag (I based how many cookies went into the bag on how many people were staying in the room, about 1 cookie for every 2 people). First, I searched online for a wedding cake cookie cutter. It took a bit but I found a good one that was reasonably priced. The cookie cutter came with a really good sugar cookie recipe, so I decided to test it out on Dan. Next, I figured out how many cookies I would need. Since the cookie cutter was rather large, I counted every one wedding cake cookie equalled two cookies per the recipe. I made the dough and baked off the cookies a few days before the wedding, so I would have time to let them cool before I had to decorate them. Decorations were done with royal icing. I made a huge batch and filled in all the cookies with the white colored icing. Next, I made flowers to look like the sunflowers we were using throughout the wedding. I piped them on parchment paper and let them dry overnight. This allowed me to attach the flowers directly to the cookies as I wanted them. I also accented the white color with burgundy lines and dots (our wedding colors were burgundy and gold). On the bottom "layer" of the wedding cake cookie I piped our names in the burgundy royal icing. The cookies were intentionally designed to look like our wedding cake, which was a 4-tier with burgundy ribbon and sugar sunflowers. Once the cookies were all dried, I placed them in clear plastic bags and tied them with burgundy ribbon. I placed a homemade sticker on the back of each. Everyone loved them and appreciated the personal touches we added to make them feel special. Just some perspective from Dan--I absolutely loved this personal touch Laurie added to our wedding hotel goodie bags. 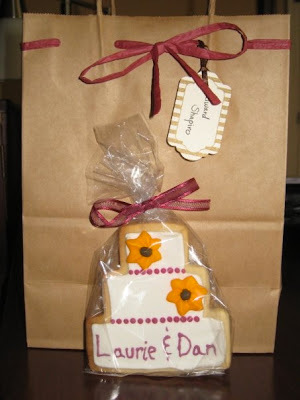 We used them as hotel bag favors, but with enough time and effort these wedding cake cookies could make for a great wedding favor to give out at the reception, or you could even make really clever wedding cake cookie seating cards. They took Laurie a lot of time and effort (and I helped a little bit here and there) but it was really worth it! 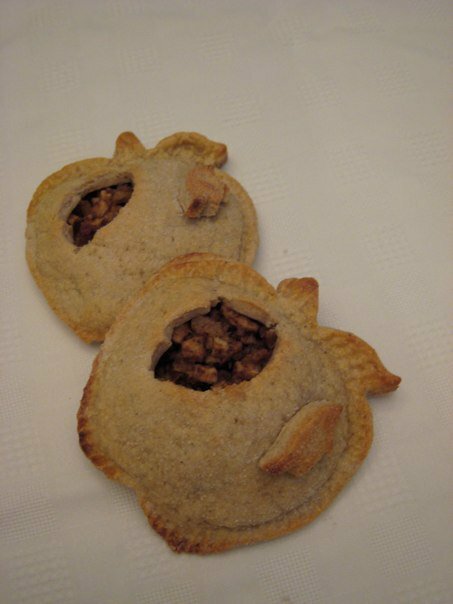 These personal apple pies were a great treat that Laurie whipped up for my family's Rosh Hashanah dinner with some friends. Laurie used a mini-pie mold from Williams-Sonoma. The pie dough recipe was pretty standard but with a few custom touches from Laurie (I add cinnamon and nutmeg to my crust). The filling was Granny Smith Apples (cut into small cubes), sugar, cinnamon, nutmeg and salt--she made them both with and without nuts, using both walnuts and pecans. And she had a clever idea to help tell the with and without nuts pies apart. She used the leaf cutout, putting it on the top of the ones with nuts and leaving it off the others. So that worked out great to keep people happy since so many people have nut allergies today. They cooked up great and made for a great personal-sized apple pie, or pocket pie. We served them up with vanilla ice cream and they were a smash hit. Another great idea to top this off would be adding some caramel sauce. They'd also make for a great Thanksgiving pie for someone looking to give a different take on a traditional Thanksgiving apple pie. 1) Don't over fill the pockets or the steam pocket will rip the dough.